This week has been full of excitement. First we have the SCOTUS ruling on the "Hobby Lobby" case. Basically Hobby Lobby, a craft store, wanted to assert an objection to the Affordable Health Care act, that required the company to carry contraceptives for their female employees siting religious grounds. I really thought this was a no brainer. I mean it's a company. Companies can't claim religious protection. I mean let's look back at slavery for example. Many "religious" people used their Bible to claim that slavery was what God intended and therefore should be legal. And if many of the Christian churches had their way today, LGBT people would be stoned. The fact that SCOTUS sided with Hobby Lobby and allowed them to discontinue specific medicines just because they disagree with it floored me. It made me wonder what exactly would someone who worked for other companies that had different religious practices do if they were suddenly forced to abide by their employers religious beliefs. The best thing out of the decision was Ginsburg's Dissent. I had already marked Hobby Lobby off my list for supplies for my business but this sealed the deal. Next we have Target's press release about open carry in their store. They presented a very well put bulletin on their page that was articulate and what I thought was pretty understanding. I posted a reply to this on their page thanking them for choosing to remove guns from the store. While I'm not the frothing liberal gun hater that I've been made to feel like over the last few months, I do agree that really there's no reason to bring guns into a store. Why do we need that? How about everyone leave their guns out. How about we look to help each other to the car with their bags instead of seeing which person is likely to be someone you can shoot? I know it's a passionate issue. There are people on both sides that are putting the wild mad dog front out there to say, SEE SEE they're coming for your guns. No, not really. How about we just try getting along with out killing each other. There's so many people getting prepared to take out their fellow man they forget that we're in this together. If more people joined together to celebrate life instead of seeing how many they could kill in one magazine I think we'd be a much better place. So I added Target back to my list of places that I'll go, provided I don't see anyone walking around with a gun on their back. Then I saw the following meme shared on Facebook. I looked through the list and thought, yeah, yeah that's right, yep. And then I thought, what if I didn't have a Michael's in my store, which is owned by Bain Capital incidentally. What if Sam's Club (Wal-Mart) was the only store in my area that I could shop at. Would it be better to drive and cost more for my car, my gas and pollute my environment instead of buying a pack of beads at Michael's? Today I don't have to shop at Wal-Mart any more. I'm a crafter who proudly states on her Facebook Shop page and her Etsy shop page that I do not use any supplies from Hobby Lobby. But not everyone is an fortunate as I am. Not everyone has the means to boycott these groups. I'd rather you buy some chicken and cook at home over eating at KFC just because Chick-fil-A donates money to anti-gay groups. I think that maybe we need to get on target when it comes to boycotting. We need to sure our aim and become better shots at scoping out who is exactly the enemy here. We're targeting the wrong people. And in the end, our freedoms and perhaps our lives may become the only casualties. 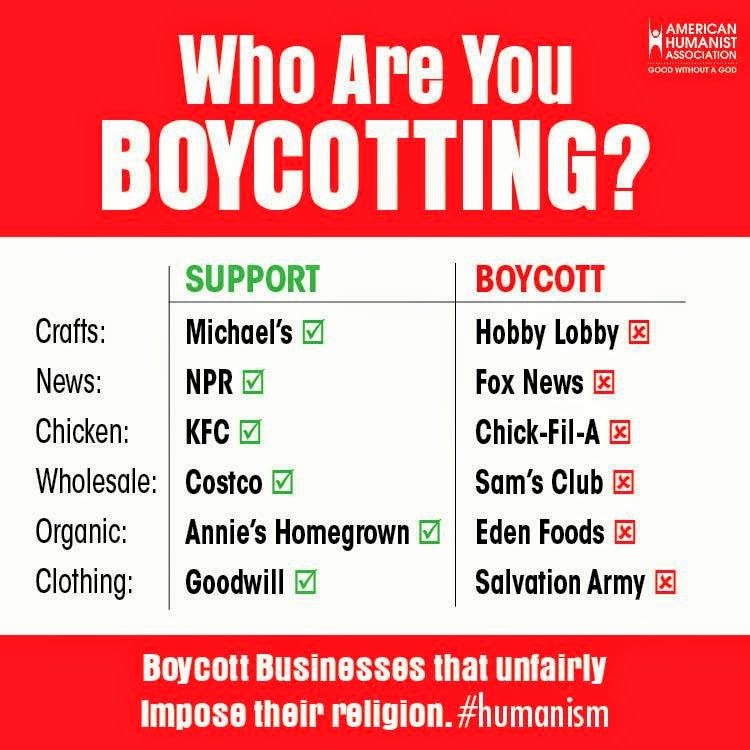 *Just to be clear, I'm not suggesting you boycott or frequent any of the stores listed on the graphic. I was only using it because i gave me a moment to pause and think about what things I personally choose to support with my money.